In this issue of the JCI, Edelmann et al. reveal that a JAK2-V617F mutation that is common in patients with polycythemia vera and essential thrombocytosis enhances risk of developing life-threatening thromboses by increasing β1 and β2 integrin affinity for the endothelial adhesion molecules VCAM1 and ICAM2. This aberrant interaction underlies also altered myeloid trafficking to the spleen. 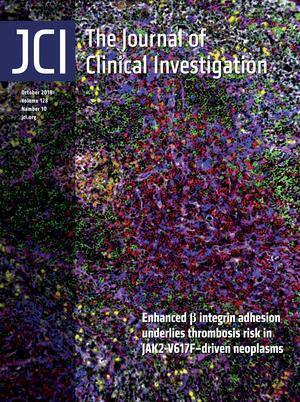 The cover image shows the expression of endothelial VCAM1 (white) and ICAM1 (purple) together with myeloid-derived cells (yellow) and other immune cell populations in a mouse spleen. Image credit: Lars Philipsen. Citation Information: J Clin Invest. 2018;128(10):4195-4197. https://doi.org/10.1172/JCI124208. Citation Information: J Clin Invest. 2018;128(10):4198-4200. https://doi.org/10.1172/JCI124375. Citation Information: J Clin Invest. 2018;128(10):4201-4203. https://doi.org/10.1172/JCI124416. Citation Information: J Clin Invest. 2018;128(10):4204-4207. https://doi.org/10.1172/JCI124523. Citation Information: J Clin Invest. 2018;128(10):4208-4212. https://doi.org/10.1172/JCI124786. Citation Information: J Clin Invest. 2018;128(10):4213-4217. https://doi.org/10.1172/JCI124493. Citation Information: J Clin Invest. 2018;128(10):4218-4223. https://doi.org/10.1172/JCI124404. Citation Information: J Clin Invest. 2018;128(10):4243-4244. https://doi.org/10.1172/JCI123884. Citation Information: J Clin Invest. 2018;128(10):4245-4247. https://doi.org/10.1172/JCI123217. Citation Information: J Clin Invest. 2018;128(10):4248-4250. https://doi.org/10.1172/JCI123388. Citation Information: J Clin Invest. 2018;128(10):4251-4253. https://doi.org/10.1172/JCI123121. Citation Information: J Clin Invest. 2018;128(10):4254-4256. https://doi.org/10.1172/JCI123266. Citation Information: J Clin Invest. 2018;128(10):4257-4259. https://doi.org/10.1172/JCI124098. Citation Information: J Clin Invest. 2018;128(10):4260-4279. https://doi.org/10.1172/JCI97117. Nucleophosmin (NPM1) is among the most frequently mutated genes in acute myeloid leukemia (AML). It is not known, however, how the resulting oncoprotein mutant NPM1 is leukemogenic. To reveal the cellular machinery in which NPM1 participates in myeloid cells, we analyzed the endogenous NPM1 protein interactome by mass spectrometry and discovered abundant amounts of the master transcription factor driver of monocyte lineage differentiation PU.1 (also known as SPI1). Mutant NPM1, which aberrantly accumulates in cytoplasm, dislocated PU.1 into cytoplasm with it. CEBPA and RUNX1, the master transcription factors that collaborate with PU.1 to activate granulomonocytic lineage fates, remained nuclear; but without PU.1, their coregulator interactions were toggled from coactivators to corepressors, repressing instead of activating more than 500 granulocyte and monocyte terminal differentiation genes. An inhibitor of nuclear export, selinexor, by locking mutant NPM1/PU.1 in the nucleus, activated terminal monocytic fates. Direct depletion of the corepressor DNA methyltransferase 1 (DNMT1) from the CEBPA/RUNX1 protein interactome using the clinical drug decitabine activated terminal granulocytic fates. Together, these noncytotoxic treatments extended survival by more than 160 days versus vehicle in a patient-derived xenotransplant model of NPM1/FLT3-mutated AML. In sum, mutant NPM1 represses monocyte and granulocyte terminal differentiation by disrupting PU.1/CEBPA/RUNX1 collaboration, a transforming action that can be reversed by pharmacodynamically directed dosing of clinical small molecules. Citation Information: J Clin Invest. 2018;128(10):4280-4296. https://doi.org/10.1172/JCI120518. Citation Information: J Clin Invest. 2018;128(10):4413-4428. https://doi.org/10.1172/JCI99481. Citation Information: J Clin Invest. 2018;128(10):4472-4484. https://doi.org/10.1172/JCI99397. Citation Information: J Clin Invest. 2018;128(10):4510-4524. https://doi.org/10.1172/JCI97965. Fibroblast-like synoviocytes (FLSs) are critical to synovial aggression and joint destruction in rheumatoid arthritis (RA). The role of long noncoding RNAs (lncRNAs) in RA is largely unknown. Here, we identified a lncRNA, LERFS (lowly expressed in rheumatoid fibroblast-like synoviocytes), that negatively regulates the migration, invasion, and proliferation of FLSs through interaction with heterogeneous nuclear ribonucleoprotein Q (hnRNP Q). Under healthy conditions, by binding to the mRNA of RhoA, Rac1, and CDC42 — the small GTPase proteins that control the motility and proliferation of FLSs — the LERFS–hnRNP Q complex decreased the stability or translation of target mRNAs and downregulated their protein levels. But in RA FLSs, decreased LERFS levels induced a reduction of the LERFS–hnRNP Q complex, which reduced the binding of hnRNP Q to target mRNA and therefore increased the stability or translation of target mRNA. These findings suggest that a decrease in synovial LERFS may contribute to synovial aggression and joint destruction in RA and that targeting the lncRNA LERFS may have therapeutic potential in patients with RA. Citation Information: J Clin Invest. 2018;128(10):4588-4603. https://doi.org/10.1172/JCI121960. Citation Information: J Clin Invest. 2018;128(10):4654-4668. https://doi.org/10.1172/JCI99317. Citation Information: J Clin Invest. 2018;128(10):4669-4681. https://doi.org/10.1172/JCI96107. Chronic inflammatory diseases are characterized by recurrent inflammatory attacks in the tissues mediated by autoreactive T cells. Identity and functional programming of CD8+ T cells at the target site of inflammation still remain elusive. One key question is whether, in these antigen-rich environments, chronic stimulation leads to CD8+ T cell exhaustion comparable to what is observed in infectious disease contexts. In the synovial fluid (SF) of juvenile idiopathic arthritis (JIA) patients, a model of chronic inflammation, an overrepresentation of PD-1+CD8+ T cells was found. Gene expression profiling, gene set enrichment analysis, functional studies, and extracellular flux analysis identified PD-1+CD8+ T cells as metabolically active effectors, with no sign of exhaustion. Furthermore, PD-1+CD8+ T cells were enriched for a tissue-resident memory (Trm) cell transcriptional profile and demonstrated increased clonal expansion compared with the PD-1– counterpart, suggesting antigen-driven expansion of locally adapted cells. Interestingly, this subset was also found increased in target tissues in other human chronic inflammatory diseases. These data indicate that local chronic inflammation drives the induction and expansion of CD8+ T cells endowed with potential detrimental properties. Together, these findings lay the basis for investigation of PD-1–expressing CD8+ T cell targeting strategies in human chronic inflammatory diseases. Citation Information: J Clin Invest. 2018;128(10):4743-4743. https://doi.org/10.1172/JCI124920.